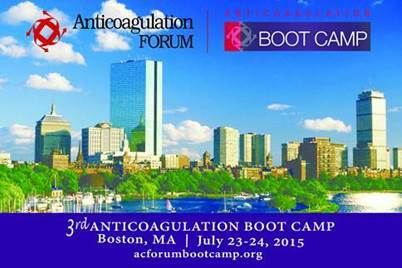 Join the Anticoagulation Forum for the 3rd Anticoagulation Boot Camp, July 23rd and 24th, 2015 in Boston. This compact 2-day conference offers comprehensive learning for those new to anticoagulation or a refresher on updates on the changing practice of anticoagulation. The AC Forum expert faculty will provide an interactive setting in a small group learning model with plenty of time for Q&A and dynamic discussion. Nursing and pharmacy CE credits will be provided. Prior programs have sold out so register soon to secure your spot. Visit http://www.acforumbootcamp.org for more information or to register. By Henry I. Bussey, Pharm.D. in Uncategorized on June 16, 2015 .